Learning the definitions of Japanese words is pretty straight-forward if you know how to find the Kanji and know how to use an online or electronic Japanese-English vocabulary as we saw in a previous tutorial. But can you really say you learned what the word means? Well, you can probably safely say you’ve learned what the word means in the context that you’re learning it in. For example, if you look up the word 「乗る」 using let’s say jisho.org, you get this. This verb is pretty straight-forward if you were looking it up in a context like the sentence below. It’s pretty obvious that the verb means “to ride” here. But it’s a bit tougher to figure out a sentence like the one below without more context. This is just a simple example of how it’s important to learn new words in context. If you were reading the sentence in context, you could probably figure out that 「話に乗る」 means to get on board with an idea or plan. A great resource for finding phrases is http://www.alc.co.jp/. In this example, it has a direct translation of the whole phrase 「話に乗る」 along with example sentences. If you’re coming in on this, we’ve gotta start talking right now. Obviously, 「話に乗る」 doesn’t mean “bite” in the literal sense of the word, so you should always read example sentences to see the full context. When you start practicing your Japanese, you will often think of a word or concept that you don’t know how to express in Japanese. Unfortunately, it’s a lot trickier to find the correct Japanese for an English phrase than it is to learn the definition of a given Japanese word. Before you try anything, do NOT try to translate very abstract or grammatical words such as “like”, “as”, and “for”. You should probably be asking a Japanese speaker how to express complete sentences and thoughts, not abstract words that likely won’t translate very well or not at all. However, if you need to find a translation for concrete, simple words like “car” or “biology”, you could try an English-Japanese dictionary. First of all, do NOT use any dictionaries that only have Japanese-English （和英） dictionaries such as the WWWJDIC or jisho.org to look up English words. These dictionaries merely give you the illusion of an English-Japanese dictionary by searching within the English definitions of Japanese words often with disastrous results. It simply does NOT work. 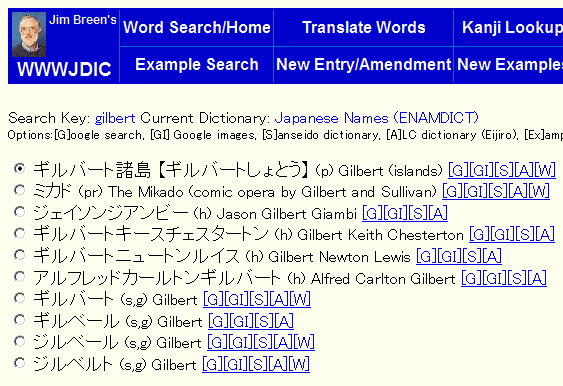 Instead, use sites that have English-Japanese （英和） dictionaries like alc (http://www.alc.co.jp) or Yahoo! (http://dic.yahoo.co.jp/). If you search for “eat”, both dictionaries return 「食べる」 as you would expect. Japanese-English dictionaries return entries that I won’t even bother to reproduce here. Personally, I prefer alc, as you can search whole phrases and idioms such as “eat my hat” and often get good results. You will often come upon a Kanji that has the exact same reading and an almost identical meaning to other similar words. Examples of this include the various ways you can write the verb “to see” which is 「みる」. This word can be written in 5 different Kanji each with a slight difference in meaning. For words that can be written with multiple Kanji, you can use the various dictionaries and example sentences to learn when to use which. Your Japanese input method editor can also be an excellent tool as the ones for OS X and Windows explain the differences between the different version when you select the Kanji. The main advantage of writing things out is you have a lot more time and resources to compose your thoughts as opposed to the rapid exchange of interactive conversations. In addition, writing things by hand gives you muscle memory as an additional memory aid. The most important thing to remember with your own writing as well as all other aspects of language acquisition is to quickly get corrections in order to avoid falling into bad habits. In addition, it’s vitally important that you actually implement the corrections yourself and not just throw aside a piece of paper with corrections on it. In the past, it’s been fairly difficult to find Japanese speakers to correct your writing. Fortunately, there is now a social networking site built exclusively for this purpose with an excellent community: Lang-8. I won’t go into much detail of how to use the site since they have their own video for the purpose right on the front page. In general, I would consider writing to be the last portion of the four parts of language acquisition: listening, speaking, reading, writing. That’s because writing itself can be considered to be an art that goes much beyond the practical necessities of communicating in a foreign language. However, that doesn’t mean you can’t jump in to writing fairly early in the learning process. The important thing is to set realistic goals and distinguish between simple writing and composition. Therefore, I would suggest writing about topics that are conversation-like. For example, contacting a friend in order to ask how he/she is doing is not only great writing practice but also becomes an opportunity to perfect your speaking skills as well. As a general guideline, at least in the beginning, I would write about things that could likely come up in a conversation. Combine that with actually talking about it with your conversation partner for a powerful learning combination. Below are just a sample of possible writing topics. The Complete Guide to Japanese also has writing suggestions at the end of each chapter. What I did last summer. What I do on most days. Why I want to learn Japanese. What I want to do if/when I go to Japan. Interesting people I know and why they’re interesting. It may seem obvious that one of the best ways to improve conversation skill is by practicing conversation and yet it’s the one activity that usually gets the least amount of attention. There are many reasons why people neglect to learn to speak Japanese by actually speaking Japanese including shyness, embarrassment, and the practical difficulty in creating opportunities for practicing Japanese. Here, we will look at strategies and techniques for creating such opportunities and having productive conversation sessions. Taking a Japanese class alone is woefully inadequate for providing the many hours of practice you need in order to become proficient in speaking Japanese. Most of the already short time in class is taken up by lecturing and listening to other classmates answer simple questions without any real interactive conversation or discussion. On the other hand, most of us are not in Japan and do not know many or even any Japanese speakers, especially ones with the patience to help others learn and practice conversation skills. The most important skill you need for finding conversation partners is being proactive. If you are taking a Japanese class, engage your teacher in conversation before or after class or during office hours. Explore any clubs or activities that may involve Japanese speakers. Check out meetup sites like www.meetup.com for Japanese meetups and find conversation partners there. If you want to practice online without having to leave the house to meet people face-to-face, you should check out www.language-exchanges.org to find conversation partners on Skype. Use your assets such as English skills to offer something in exchange for getting help with your Japanese conversation skills. With the large number of Japanese speakers on the internet, you should be able to find one or more conversation partners relatively quickly. But how should you proceed from there? You don’t know what you should talk about and more importantly, you think you have no idea how to say anything in Japanese! Relax and remember the whole point of practicing is to make mistakes and learn from them. There would be no point in conversation practice if you already spoke Japanese perfectly. Let’s look at a couple of strategies you can employ to make sure you have a smooth and informative conversation session. This means that if you just started learning Japanese, find a conversation partner that can speak your language fairly well. The better you get at Japanese, the worse your partner can be at your language. This ensures that there’s at least some method of communication so that you can actually learn from each other. Here’s a short list of topics for you to get started. Bring a notebook or save your online chat log. Having a record of the things you learned will greatly increase the value of each conversation session and help decrease the amount of things you forget. In addition, writing new words and phrases encountered in your conversations by hand can also aid memorization. If you don’t know how to say something, don’t just say nothing! Ask your conversation partner how he/she would say it. The best way to learn is by asking, “How would you say this in Japanese?” Sure, we all want to be clever and original but when you’re learning a language, you’ll first need to get familiar with how most everybody else would say it. Also, it’s important to follow up with questions so that you understand why it’s said that way. In this manner, you can also learn new grammar and expand on what you’ve just learned. Japanese people are also often too polite to point out your mistakes without being asked for corrections. If you’re not sure what you’re saying is correct, make sure to ask. Also, make it clear from the beginning that you would like as much corrections as possible. For your part, don’t be afraid or embarrassed to make mistakes nor should you feel frustrated or resentful at being constantly corrected. Mistakes (especially the embarrassing ones) are the best ways to learn and being corrected early will help you avoid bad habits before they form. What is the meaning of [X]? How do you say [X] in Japanese? Please say it one more time slowly. Sure you want to help the other person learn your language but that doesn’t mean you should spend most of the time helping them learn instead of you. Make sure you spend at least 50% of the conversation time learning what you need to learn. If your conversation partner always answers in your language and not in Japanese, point out that fair’s fair and you’re not doing this just for him or her. Personally, I’ve found it easier to switch each session between learning Japanese and English so that it makes the boundaries easier and completely fair. This should be fairly rare but if you happen to have a conversation partner that doesn’t seem willing to actually help you learn Japanese, you should politely move on to another conversation partner. In the old days when we walked to school uphill both ways, we used to have to use actual books to look up words written in Kanji. The process involved guessing what the radical was for each Kanji, flipping through a huge tome, finding the readings, and flipping through another huge tome guessing which combinations of the readings applied to the word you were looking for. Luckily for you, we don’t need to do that anymore. If the word you’re looking for is on the computer whether it’s a website or email, you’re in luck. You don’t need to look up any Kanji at all. Install the main extension and a dictionary (Japanese-English is probably the most complete) and restart Firefox. If you use Chrome, you can find a similar extension called rikaikun. Now, if you run into a gnarly Kanji like the one below, you just have to turn on rikaichan and mouse over it. Incidentally, you can use rikaichan on all the vocabulary on this site. I never would have spent those countless hours adding the popups manually if rikaichan existed at the time. 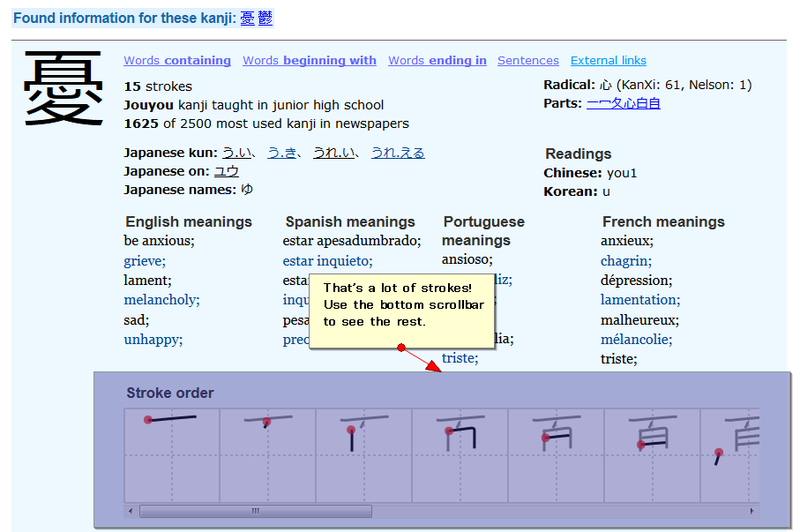 If you want to learn more about the Kanji such as the stroke order (very important! ), you can simply copy+paste the word into jisho.org. You may also want to do this if rikaichan returns multiple readings and you are unsure which one to use. The dictionary labels more common readings as “Common word”. Assuming you searched for a real word, you should see an “Kanji details” button that will automatically look up all the Kanji in the selected word. Make sure to check the stroke order image. The red dot shows where each stroke starts. If you need to look up a word that’s written on (god-forbid) paper or some other non-electronic medium where you can’t copy+paste, you need to go through a couple more steps. First of all, most of the newer electronic dictionary models from brands such as Casio, Sanyo, and Canon now have a stylus that allows you to write the Kanji directly. It may be a bit expensive especially outside of Japan, but I think it’s a worthy investment for the serious Japanese learner who doesn’t want to have to read books sitting next to a computer. However, if you’re already paying for an iPhone or other smart phone with internet access, that’s another option. Or you can keep reading to see how you can do it for FREE! If you happen to already know other words that use the same Kanji, all you need is a bit of creative mixing and matching. For example, if you don’t know 「決定」 but you know 「決める」 and 「定期」, you can just type the words you do know and delete the unwanted characters. 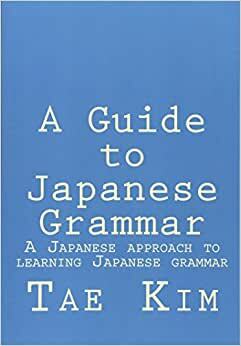 This technique is particularly useful for those tricky readings like 「仲人」. Just type 「仲間」（なかま） and ［人」（ひと）, delete 「間」, and hit search. Now if you’re trying to find a word with Kanji you’ve never seen before, you need to find each one and stitch the word together using copy+paste. 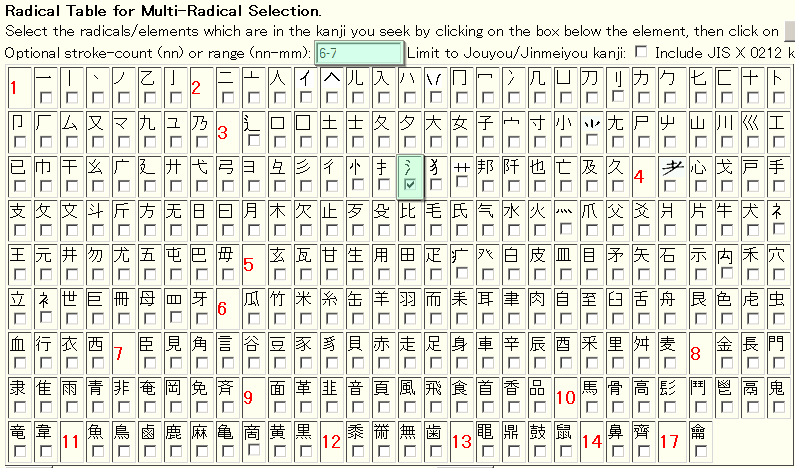 The multi-radical Kanji search is one of the easiest ways to find Kanji. No more do you have to remember which arbitrary radical the powers that be chose to be THE radical for the Kanji. You can search on any of them. You may also want to try http://jisho.org/kanji/radicals/. It has a nicer interface and offers real-time search results. In order to narrow down your search, you’ll probably want to add in the stroke number. You can be lazy and just do a rough guess by providing a range but you might have to sort through a larger list. Here, I searched for 「決」 by selecting the water radical with a range of 6-7 strokes. I do get a fairly sizable list but it’s not to hard to go through the list to find the Kanji I want. If you’re confident that it’s a Jouyou or Jinmeiyou Kanji (a list of common characters compiled by the Japanese government), you can also check the “Limit to Jouyou/Jinmeiyou kanji” box. This cut my search result to only 17 candidates. Now all you need to do is copy+paste it somewhere either in another tab or text editor and find 「定」 using any technique. Once you have all the Kanji you need, you can copy+paste them together to form 「決定」 and search as before. If you really can’t find the Kanji because you can’t identify any radicals and there are way too many characters with the same stroke order, the last ditch effort is to use the IME pad (or other equivalent depending on your OS). You need to be in an area where you can type text such as the search box in Japanese input mode. Click the pad icon on your IME toolbar and select the first option. Mine says 「手書き」 but yours may be in another language. Clear the drawing by pressing the 「消去」 button and draw the character using your mouse. Click the character you want in the box to the right of your drawing. It will type that character in the area you were at when you opened the pad. If you find the main WWWJDIC website a bit slow at times, you might want to try a mirror closer to your location. I found that the USA mirror was a LOT faster for me compared to the main site. Before you can fully start taking advantage of online resources, you’ll want to make sure your computer is properly configured to support Japanese. Fortunately, this has become a lot easier with modern software, often only requiring setting some configuration options and in some cases, inserting the original installation disk. Below are guides that explain the process fairly well. Here are a few tips that I found useful for using Japanese on the computer. You can safely remove the English language setting. This is done in the same window you used to add Japanese input language. Simply click the “EN” English input language and click “Remove”. It will inform you that you will need to restart to remove it completely. The Japanese input mode already allows you to switch to English so having a separate English setting is redundant and only adds more key-strokes for switching languages. Press the Alt and “~” keys (the tilde key left of the “1” key) to quickly switch between English and Japanese input. If you have a Japanese keyboard, you can simply press the 半角／全角 key, also located left of the “1” key. Press the F7 key after you type something to quickly change it into Katakana. While not necessary for displaying and inputting Japanese, some older Japanese programs may require you to set Japanese as the default language in order to function properly. This will also replace your backslash key with the Yen mark. Press the command key and space-bar to toggle between the current and the previously used input method. This shortcut replaces the shortcut to bring up spotlight. That shortcut should now instead be ctrl+space. All shortcuts can be configured in the “System Preferences” under “Keyboard & Mouse”. In order to start typing in Japanese, you should be at least somewhat familiar with the main concept of Hiragana, Katakana, and Kanji. Though there are some minor differences, the basic concept behind typing in Japanese is the same for all platforms. The vast majority of people type using a modified form of romaji, or the latin representation of Japanese sounds. By default, the text will display as Hiragana. When you’ve finished typing a word (or words), you can press space to convert the Hiragana to Kanji. If you do not wish to convert, you can simply press “Enter” to enter as is. Or you can press “Esc” to quit and start again. After you’ve converted the text by pressing space, you can simply continue typing the next phrase without having to press “Enter”. Here are some tips on how to type certain characters that differ from regular romaji. Some input methods will be able to figure it out with just one ‘n’ most of the time but others require you to type it exactly as ‘nn’. Small Characters = prepend ‘x’ or ‘l’ (depending on the OS). For example, 「ぁ」 (smaller than the regular 「あ」) can be typed as “xa” or “la”. 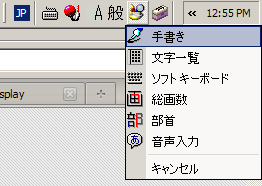 The input editor will usually type small characters automatically by context such as 「きゃ」 (“kya”) or 「ファ」 (“fa”). However, you will sometimes need to type it explicitly for ambiguous situations such as 「ティ」 (typed as “texi” or”teli”). The phonetic representation “ti” will output as 「ち」 instead. Though these characters don’t actually have a “d” sound, they belong to the same category as other d-consonant sounds. If you wanted the phonetic “di” （ディ） and “du” （ドゥ） sound, you would need to type “deli/dexi” and “dolu/doxu” as explained above. There are many tools and resources that are helpful for learning Japanese (and perhaps some that are not as helpful). For the beginner, it’s not obvious exactly what resources are available and how to use them. Here, we will go over some of the best tools and resources for learning Japanese along with a simple tutorial of how to use it and for what purpose. For those who don’t want to read the entire tutorials, here’s a list of all the resources which are covered. In addition, NIHONGO eな is also a good site to go for learning how to use various online sites and tools for learning Japanese.